The Eleventh House is commonly referred to as the House of Friends. Through our friends, we find strength in numbers - we see the power of the collective, the group. Groups addressed by this house include clubs, organizations, social groups, networking organizations and professional associations. The focus here is on the activities we undertake within these groups, how we make a difference and as a result, how we grow and actualize our true selves. Further, it’s the group, by virtue of its collective strength, which helps to define what we as individuals will do. As we grow, we have more opportunities and possibilities available to us, and the Eleventh House addresses these. Our interactions and efforts are in keeping with our priorities in life; these interactions have the ability to enhance our lives. A labor of love? Yes, in many ways. Through our friends and group activities we add substance and meaning to our lives and to society. The Eleventh House also speaks to destiny - in simple terms, our hopes and dreams, what we desire and what we want to achieve. Our creative vision is highlighted, the simple act of working toward our maximal selves. The power of collective creation, as well as the creative sparks generated by the group, are also important to this house. By banding together, we can create so much more. In joining with our friends, we not only accomplish a great deal, but we can also enjoy the fruits of our labor. The Eleventh House also addresses the kind of friend we are: what do we do for others? How do we view our friends? How do they view us? It is our basic character which, to a great extent, defines the friends and groups we choose. Oftentimes, we work with our friends toward a greater good and in the hope of improving society. This is our philanthropic side coming to the fore, the ability to selflessly and eagerly help others. It is also our humanity manifesting itself most effectively. At times, we may upset the proverbial apple cart, but the sum total of our efforts should be to look at the end result. If that’s good, then the process of getting there, for better or for worse, is worthwhile. Lastly, the Eleventh House also governs stepchildren, foster children and adopted children. The eleventh house concerns friendships, and how we support each other toward making progress in the wider world. While the fifth house is about creativity that emerges from the Self, the eleventh house outlook is toward collaboration. And friendship here is nurtured through cultivating those kinds of projects, or supporting others, as they reach for their dreams. In the vast, overwhelming field of potential, the eleventh house aligns you with others reaching for similar achievements. And this helps you feel part of a web of support that stabilizes your goals. 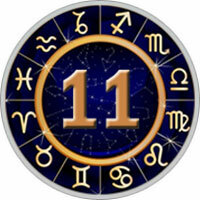 The Eleventh House is ruled by Aquarius and the planets Saturn and Uranus.